TruePublica Editor: American behemoths such as Google, Facebook and other transnational corporations are now so big that ethics plays second fiddle to profit and legislators feel somehow emasculated to act in the public interest. Revolving doors obviously plays a role in the cesspit of modern day politics. These transnationals are breaking all the rules where anarchy by the rich and powerful is endemic to civil society. While all attention is turned on the constitutional and political crisis Britain faces with Brexit, Britain’s mainstream media misses another important story. For Google, it is a good time to bury bad news. Google has announced it will integrate a UK-based health company into its main organisation, igniting concerns that the tech giant will misuse NHS patient data that the health company had been given access to. Having promised it would never do this on ethical grounds, Google has just done the opposite. It was only in July last year that data belonging to 1.6 million patients was illegally shared with Google after an NHS trust tested a medical app with the tech giant. 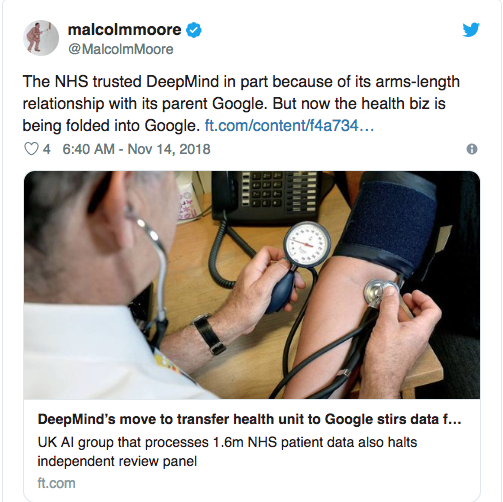 The UK’s data protection watchdog found that a partnership between DeepMind and the NHS had violated privacy laws, not that it did anything to deter Google. DeepMind, a company that develops artificial intelligence (AI), was purchased by Google in 2014 and will merge its health division with Google Health, a new venture focused on consolidating the tech giant’s health-related projects. 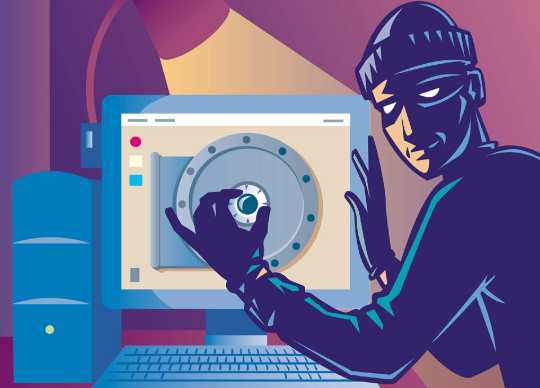 The news has quite rightly caught the eye of privacy advocates and even government watchdogs. Patient’s hadn’t been told that their private medical data –which may have included details of drug abuse, abortions or HIV status– would be crunched and analyzed by the Streams app. DeepMind released a statement pledging to “do better” and established an independent review panel. Now, however, the absorption of DeepMind into Google has done away with that review panel and given Google direct control of patient data. Regardless, the tech giant now holds reams of patient data with no oversight. We should not forget that Britain’s NHS is the biggest single buyer of pharmaceutical goods in Europe, which often sets the price across the EU and that in any trade deal with the USA, the NHS is up for grabs. So far, so Silicon Valley. But granting private companies, especially ones as omnipresent as Google, access to medical information could have dire consequences. Facebook is another company that feels having access to your private medical history is of value. After Facebook was rocked by the Cambridge Analytica privacy scandal in March, it emerged in April that the company had sent a doctor to multiple top US hospitals in an effort to convince them to share patient data, including illness and prescription information. Facebook’s project reportedly sought to collect anonymized personal details, which could be then matched up with user data from the social network. The stated goal was to help hospitals figure out which patients might need special care or treatment. While the project was abandoned, none of the patients involved had consented to sharing their data. It goes to demonstrate quite clearly the lawlessness of these organisations. There is an overall trajectory we should all be concerned with. While understanding technology can be a good thing, in the hands of these transnationals literally anything could happen (who would have thought FB would allow micro-targeting to usurp democracy). Allowing them access to private health information, along with social media and search data will eventually be used in a commercial social scoring system. For instance, a car insurer might increase your premium if social media data suggests you like socialising too much or that you’ve been searching a health issue or seeing a doctor about a health concern. One thing is for sure. These technical titans need to be put on a leash and proper anti-competition laws established to break them up and create a more thriving competitor market than exists today. And like the EU, Britain should enforce hefty fines for their breaches of basic laws designed to protect us. However, in a country with the worst privacy laws in the democratic west, we can only expect these egregious invasions of privacy to continue. Google has not been stopped by the government in this latest action to steal our most private data without our consent.